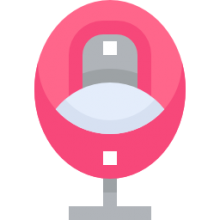 A Papasan chair or sometimes called a bowl or saucer chair that’s round and set up like an elevated bowl with a thick, round cushion. These chairs were commonly made from wicker or rattan, but modern chairs can be plastic or metal (Source). Sit down in the chair, get comfortable, and relax. While it’s natural to assume these chairs are more of a novelty and decorative, the truth is that they are quite comfortable provided you take a few things into account, such as ensuring the chair is appropriately stabilized to maximize support. Try not to twist or lean too much because you could throw off the chair’s balance (Source). In this section, we take a deeper look into five Papasan chairs for you to consider if you’re in the market. Each of these chairs would make a fun and neat addition to your home or the college dorm. 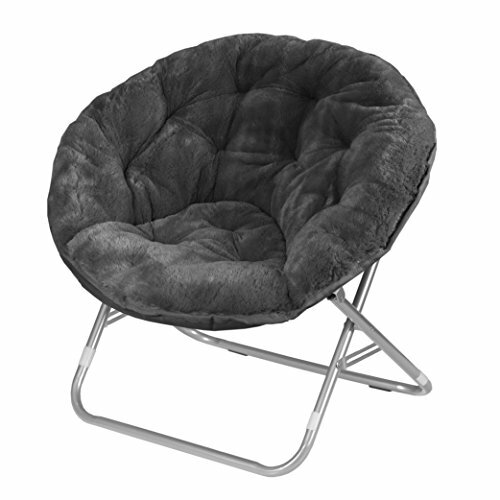 The Urban Shop Faux Fur Saucer Chair features a sturdy metal frame and comes in a variety of colors to match virtually any decor. The fabric is made with 100% micro mink synthetic fur and is soft, plush, and comfortable. The metal frame features a safety locking mechanism to ensure stability. Lastly, it folds up for easy storage (Source). 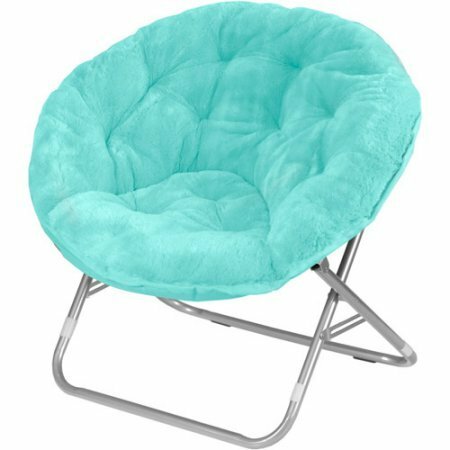 The Blazing Needles chair features a 100% polyester twill cushion that’s thick and comes in multiple colors. At 52 inches wide, it’s able to fit comfortably, kids and adults. Note that this cushion doesn’t come with the frame and you’ll have to purchase that separately; this is an excellent choice if you want to get that perfect frame to match your interior, but need a soft, comfortable cushion. The International Caravan is a 42-inch chair cushion attached to a solid rattan base. The twill cushion is soft and plush. Unlike the other chairs we looked at, this one is only available in navy, but it’s still a good value and comfortable chair if you don’t mind that color. Next is the Urban Shop Oversized Moon Chair. This chair — as the name implies — is large, and it’s comfortable to sit in for long periods of time. The polyester cushion is easy to clean and comes in a variety of colors. Like the other Urban Shop chair, this one also sits on a sturdy metal frame that folds up quickly for easy storage. Overall, this is a very comfortable chair at a price that makes it ideal for both home and college use. Lastly, the Mainstay Saucer Chair features a thick, soft, cushion that sits on a folding metal frame that’s sturdy and stable. The cushion is available in a variety of colors and is made from 100% polyester, so spot cleaning shouldn’t be difficult. Like the other metal frame chairs we looked at, this one also folds quickly for when you need to store it or put it off to the side. 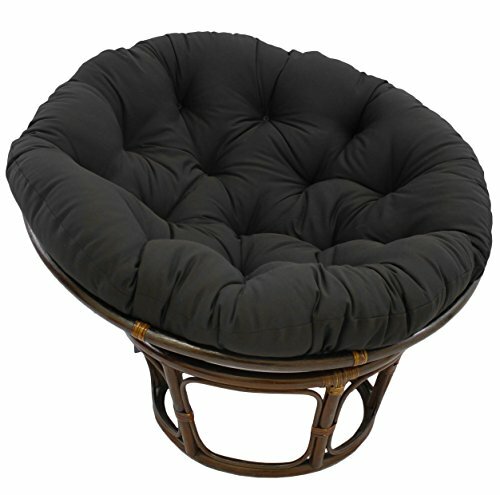 This papasan chair offered by Urban Shop is comfortable, well-made, and an excellent choice for teens and young adults. Users love the eight color options, but some do note that the product is not as fluffy as it appears to be. The Urban Shop saucer measures 29” x 32” x 22”, and it features a 100% micro mink fabric, a durable metal frame, and a weight capacity of 225 lbs. Another great thing about this unit is that it has a safety locking mechanism so that you don’t have to worry about falling. What’s more, it folds quickly, which is perfect because you can store it easily wherever you want. As a whole, buyers have a favorable opinion of the Urban Shop faux fur chairs, and they are satisfied with the quality and design. A reviewer comments that the chair is cute and comfortable and that her cat has taken a liking to it. She adds that a large adult will not fit, but it’s perfect for a 5-feet tall one. Another user states that the fabric is soft and that the frame feels durable and sturdy. A purchaser also mentions that it folds flat smoothly and that these papasan chairs don’t require any assembly and work wonderfully right out of the box. However, some customers point out that the product is too small to fit an adult and that it’s not as large as they expected. If you are wondering how to relax at home, you can take a look at this papasan cushion offered by Blazing Needles. Users love the design, but some do note that the frame is not included in the package. The blazing needles papasan pillow is available in three sizes – 44″ x 6″ x 44″, 48″ x 6″ x 48″, and 52″ x 6″ x 52″, and you can choose from 22 available colors. The cushions feature a classic tufted style and a soft premium twill fabric (100% polyester) for maximum comfort. What’s more, it’s made in the USA. A reviewer mentions that the Blazing Needles product provides far more cushioning than she initially expected and that she was surprised by its quality. She adds that the fabric feels thick and that it’s one of the most comfortable papasan pillows she has ever bought. Another buyer states that the cushion fits her papasan chair perfectly and that the color matches the pictures. A purchaser also observes that the fabric is tough but comfortable and that it doesn’t smell, as she expected. However, a couple of customers have complained that the pillow is not as thick as they expected and that the material feels weird. This papasan chair offered by International Caravan is well-made, stable, comfortable, and perfect for a gift. Users love the price and the color, but some do note that it’s made in Indonesia. The International Caravan product measures 42” x 42” x 35”, and it weighs 29 pounds. It features a sturdy rattan frame, which is great because it offers ample support, and a brown lacquer finish. Another excellent thing about this product is that the pillow is made of twill fabric, filled with polyester for maximum comfort when you decide to relax in the chair. As a whole, users have a high opinion of the International Caravan chair, and they highly recommend it as one of the best papasan chairs available. A reviewer comments that the package arrived well-packed and with no damage and that the cushion is very soft. She adds that it fits her perfectly and that her dog also loves to sleep in it. Another buyer mentions that the papasan chair is smaller than he initially expected, but it’s a great addition to her living room. A purchaser also shares that her daughter loves it and that the color is true to the picture and looks awesome. However, one customer has complained that the product breaks too easily and that she is disappointed by its quality. Some also point out that delivery took ages. 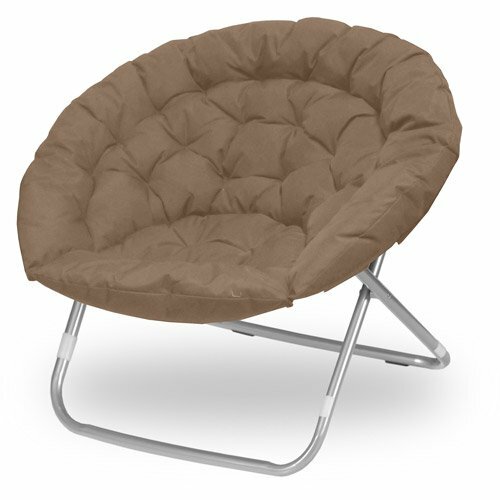 If you are looking for a comfortable papasan chair to relax in the evenings, you might take a look at this one offered by Urban Shop. Users love the size and that it’s easy to clean, but some do note that it squeaks. The Urban Shop saucer chairs measure 37″ x 30″ x 30″, and they are available in seven colors so that you can find the best to match your living room. The moon chair is made of polyester and it’s foldable, which is great because you can store it wherever you want. Another excellent thing about this unit is that it’s oversized to provide additional comfort. A buyer shares that the pillow is plush and comfortable and that the quality of the frame is far better than she expected. She adds that it’s light enough to move around without problems and that she is going to buy another one soon. Another user mentions that the beige color looks darker than the provided pictures, but it’s durable, sturdy and ideal for her dorm. A reviewer also comments that she bought two saucer chairs and that they are big, comfy and require no assembly. However, some customers have complained that the product is too small for their liking and that it’s not as comfortable as they expected. Some also point out that they are disappointed with the color. This papasan chair offered by Mainstay is stylish, fluffy, well-made, and an excellent choice for apartments or dorm rooms. Users love the price and the design, but some do note that it’s too small. The Mainstay saucer measures 30″ x 28” x 29″, and it features a foldable steel frame for durability and stability, a soft, wide seat, and a weight capacity of 225 lbs. Another great thing about this product is that the pillow is made of polyester for maximum comfort and you can fold it easily wherever you feel like it. What’s more, the chairs are available in nine colors so that you can choose the best match for your room. A reviewer comments that the faux fur is very soft, cushy, and light so that she can move it from room to room. 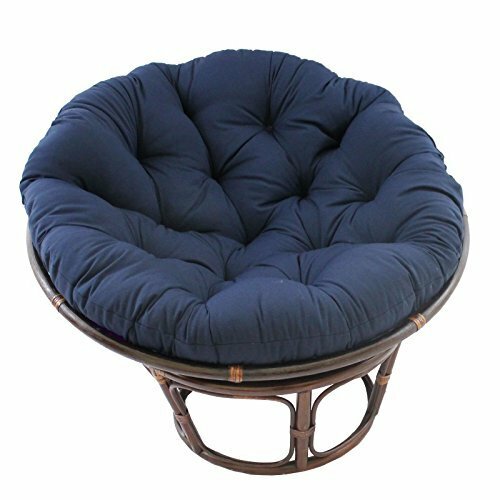 The user adds that it’s one of the best papasan chairs she has ever had and that she highly recommends it. Another user states that it’s the perfect size for a small apartment and that it comes fully assembled. A buyer also shares that the frame feels sturdy and durable and that she has been using for months with no issues. She also remarks that the color matches the picture. However, some customers have complained that the chairs are too small for an adult and that they are more suitable for kids. According to Wikipedia, this style of chair is also known as a moon or bowl chair because of its expansive and full shade seating area. It’s customizable because of the angle adjustability. Interestingly, this style surged in popularity when World War II service people from United States returned from Asia with them. Apparently, these elevated bowl seats had been used in Japan and the Philippines for hundreds of years. An important, double seated version of this style is called the mamasan. Homesthetics also has an interesting writeup, explaining why this style is so cool. They say that it is emblematic of the 1970s when it inundated reality television shows and appeared inside of glossy catalogs. People love the design, style and the outrageous colors it came in. However, they say, that it experienced a rapid decline in popularity after the wild and crazy 1970s. They cover a variety of different styles including rustic, turquoise, blue, poolside, extra-wide, Victorian, hippie, Post-Modern, oval, swing set and ribbed. They point out that because of revivalist movements that seek out earlier fashion trends and celebrate them, this chair has experienced a popular resurgence in our cultural imagination. They also make an interesting point that one of the best-selling aspects when it comes to marketing these chairs is that people love nostalgia. There are a lot of people that grew up with these chairs in their homes in the 1970s and now when they see them for sale they’ve got to have one because they remind older adults of their youth. Besides capitalizing on our love of nostalgia, they are also comfortable seating options that might have some unique ergonomic benefits. One of the favorite ways we’ve seen them used is situating them on a deck or patio overlooking a pool- they look extremely luxurious and almost give the atmosphere a swank, Moroccan vibe. Rustic options that sit cradled in treated bamboo look especially Oriental. There are even some lightweight, weather resistant options that can be left outdoors or carried along on camping trips. We’ve even seen some sets for sale- you get the chair, but also a footrest with a bean bag cushion and a side table with a glass top. Probably one of the crazier designs we’ve seen is one that hangs suspended from a ceiling allowing you to swing on it. Over in the male living space section of Reddit, one user was looking for a recommendation for his living room. He conceded that this style of furniture is somewhat polarizing, but he likes to look so much that he wants to invest in a quality option that will last a long time. He says that he would also like to supplement it with an outdoor base so that it can be used on sunny afternoons to get some tanning in. Some of the options he had been looking at including those sold by Wayfair, Overstock, Alibaba, Walmart, Target and eBay. One person said that he’s pretty tall and he fell in love with the Pier One version. Another person said that his girlfriend bought one and that the first time she sat down and it actually broke. They returned it and got a replacement and it has been with them for over a year now. The original poster says that in his research he’s found that the regular indoor option less sturdy and well-built, which is why he’s leaning towards purchasing an outdoor furniture option. Over in a labrador dog forum section of Reddit, one user posted an image of their dog completely curled up on one of these chairs. Apparently, they had found it to tossed out on the side of the road and they decided to rehab it by installing a new cushion to make for an elevated dog bed. This can be a fun DIY project and a cheap way to Source your own Papasan chair. Another interesting forum thread we discovered in our research comes from the no stupid questions section of Reddit. There, someone was wondering how do you sit in a papasan chair? The poster said that he was looking around to buy a comfortable reading chair, and had bought a papasan chair, but has not discovered the best way to get comfortable in it. He was wondering whether it would be a good idea to invest in a stool so that you can elevate and stretch out his legs. The top response came from a user who says that in his own case he’s been using his without a stool- positioning the base at a slight angle so that they are able to curl up inside of it and then sometimes dangle their legs off the edge. Another person said that the way they like to use it is to curl up with their knees to their chest.